The 11th Street Bridge Park, a project of Ward 8-based nonprofit Building Bridges Across the River at THEARC and the D.C. government will be Washington, D.C.’s first elevated public park. 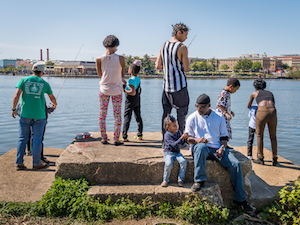 Located on the piers of the old 11th Street Bridge and spanning the Anacostia River, the Bridge Park will be a new venue for healthy recreation, environmental education and the arts. In October 2014 the design team of OMA+OLIN was selected to build the park and the Bridge Park launched an ongoing capital campaign, securing more than $10 million to date. Anchored in nearly 700 stakeholder meetings, the Bridge Park encourages ongoing dialogue with the community who participate in forming plans around design development and economic impact of the park. While the 11th Street Bridge Park and similar projects across the country are addressing factors of economic displacement in surrounding neighborhoods (see the Bridge Park’s Equitable Development Plan), we often struggle to tackle the less tangible effects of our projects—cultural displacement. Though cultural displacement can take different forms—from change in a neighborhood’s physical characteristics (like architecture or landscaping), demographic shifts, or a new coffee shop that opens down the street—it’s about when residents feel a dwindling sense of ownership over their space. At the Bridge Park, we are tackling this issue by incorporating principles of inclusivity, participation and resident-led problem solving. Currently, we are initiating cultural projects with local artists that highlight and elevate their work in the neighborhood and across the city. These artists and local residents are involved in a continuum of discussion about how large scale development is impacting our city and its potential effect on our surrounding community. With support from an ArtPlace America grant and wonderful collaboration with partners at Washington Performing Arts and their Mars Urban Arts Initiative, the Bridge Park team has turned to Ward 8 cultural leaders and artists to develop community-driven programming that places artists and cultural spaces at the center of dialogue about change. Our Arts Task Force has created a number of projects that we will be implementing over the next six months, including hosting a community curated film series, creating a blues speakeasy to highlight artists working east of the Anacostia River, and conducting a candlelight lantern walk that reflects on the history of building homes in historic Anacostia. To augment these programs, the Bridge Park has also initiated a number of placemaking projects with support from The Kresge Foundation. These include an urban garden project with faith communities on both sides of the Anacostia River, the installation of public art made by student artists from local high schools, and a storytelling project with Double Nickels Theatre Company. In upcoming posts, we and our partners/local residents/artists look forward to sharing more about developing this arts programming, what is working, what we are learning, how limited resources are used, and what can be improved. At the same time, we hope to hear from others who are working in their communities with this same issue. What measures are you taking to mitigate cultural displacement? To learn more about the 11th Street Bridge Park visit bridgepark.org.